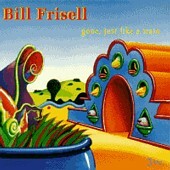 Gone, Just Like A Train assembled the talents of Bill Frisell with country bassist Viktor Krauss (who first played with Bill on his Nashville album) and the legendary studio drummer Jim Keltner, who has played with just about everyone under the sun. This album was the first Frisell album since the breakup of the Bill Frisell Band with Joey Baron and Kermit Driscoll to feature Frisell playing with a drummer. What is so remarkable is to hear how far his sound has progressed since the breakup of that group. That band seemed much more based around threeway interaction than the group on Gone, Like A Train, which becomes more of a vehicle for Frisell's guitar playing and soloing. Unlike the frenetic Baron and Driscoll, Keltner and Krauss provide a solid, broad bed of sound for Frisell. They are an incredible rhythm section, with Keltner permeating the beat as opposed to mechanical to time keeping, and Krauss's warm tone blending into the mix almost without being noticed. On a side note, Keltner actually toured with this band, which is an extremely rare occurence for this high demand studio drummer. The album is a seemless melding of many Frisell elements: country, jazz, rock and folk. It is a wash of American sound, utterly familiar, yet on close listening it is highly original. Each song is an individual gem, intense and beautiful. Ballads like "Girl Asks Boy" and "Ballroom" are exquisite, tender jazz/folk melodies that rank among some of the best things Frisell has written. The producing of this album is also excellent, creating a warm, close sound that makes Frisell's harsh angularity of the 1980's a distant memory. In many ways this album marks just how mainstream the Frisell sound is becoming. While he does still take his sound out into gritty rock territory on songs like "Blues for Los Angeles" and "Lookout For Hope", this really shouldn't be that shocking to a generation raised on The Doors and Jimi Hendrix. This album is also pretty stripped down on ways of effects. Frisell's proliferation of loops and effects are for the most part absent, relying on clean electric and acoustic tones with excellent songwriting. Frisell's sound has become much more tonal and pretty, but it is still just as interesting.